Room rates are from CA$115.00/night which includes free wifi. The hotel offers free breakfast to overnight guests. The class will also have a continental breakfast in addition to lunch and breaks. WORKSHOP FEE: $1,099 USD “Early Bird,” $1,199 USD after March 24, 2019. Includes all workshop material plus continental breakfast, snacks, and lunches. Special Offer! $100 per person discount for multiple attendees from the same company. 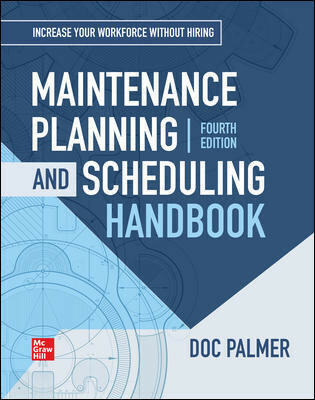 McGraw-Hill's Maintenance Planning and Scheduling Handbook is not required, but a limited number will be available for sale at workshop. Enter the name of the person who is filling out the registration for the workshop. If this is you and you will also attend the workshop, be sure to enter your name in the "Names of Attendees." Select the total number of workshop attendees and enter the names of all below. If you will attend the workshop, list your name first. Your total cost will be reduced by the following amount. Please select the method by which the registration fee will be paid. Enter the email address associated with your Paypal account.